When I had the idea for the Tangle a Day Calendar, it was mostly to provide a handy and daily space to play with Zentangle. The idea was to do a little bit each day (each square being only 2"x2"), and eventually filling up the month with lots of fun. January was pretty much that way. But February was not. The month started with our home being without power for a few days. It was way too cold to venture away from the fireplace. Once the power came back, there were days of playing catch up with all the work I missed (working from home has its issues). So basically, it was more than a week into February before I finally sat down to begin my tangle calendar play. One thing I realized during my February play, is how 'in the box' I was about the calendar. Ok, so there are days with numbers. And tomorrow is not today and last week is not tomorrow. The numbers help us keep track of all that. But they are just numbers. I was feeling compelled to only work on the day that I was in, instead of letting myself float to the other side of the calendar. Because February was so "messed up" already, I felt free to go wherever I wanted, regardless of the number or the little grey lines between the boxes. Just like the string in a Zentangle, it's good to remind myself that it's just a suggestion of structure, not a rule. And there is no such thing as 'too late' or 'too early' when it comes to going with the flow. There is only going with the flow. The flow doesn't care what time it is. I had a lot of fun. March starts tomorrow and I'm excited about that! The Diva's tenth weekly challenge: The Space Between. Yum. If we can stop naming and defining and categorizing the things we see and hear, it's possible to find the space between things and words. I would liken this experience to watching a movie that has a rather complicated story line. I don't know about you all, but I get very antsy and overwhelmed when I can't gather all that is happening and all they are saying and what it all means so far. I feel like I will never understand what is happening with all that information coming at me. But once I get to the point where I don't care what's happening, (I actually just give up) is usually the point when I start to get it. The only way I can describe it is to say, I begin to feel the space between the words and actions that I have taken in. And the only way that 'feeling the space' happens for me, is if I just give up trying to figure it out. Sort of like opera -- I can't understand what the words are, but if I just quit trying, I can settle into the feeling of it. Zentangle is like that... there is nothing to name (although if you want to, you could go there), no preconceived outcome of what is 'supposed' to be (although one could go there, too). Settling into the lines and then moving with the way the lines feel when I do them is a lot like watching a movie without thinking too much about what it's supposed to be. Now that's some fun. One more yummy taste of January. This lovely morsel comes from Martha Reppert. Thanks for sharing with us, Martha. What a beautiful month you must have had! Thanks for sharing, Kathy! Hope you have a great week in Whitinsville! Friday night I taught Zentangle to a group of nine new students. The weather is finally giving us a little break, and people want to GET OUT! 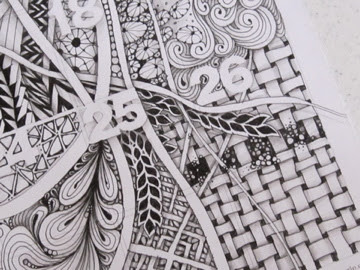 Zentangle is a perfect way to begin a new chapter of weather! The class was held at Gallery 510 in Dayton's Oregon District. A big thanks to gallery owner, Loretta Puncer, for hosting this every month. It's a wonderful, eclectic gallery, a great space for a class. She also makes one of the coziest cups of coffee ever! On Saturday, Daved and I drove a couple hours to Westerville, Ohio to teach an Intro to Zentangle class to a group of 16 quilters. We held the class at a Panera Bread, which worked out quite nicely! They did two sets of tiles, the second being a string that, when the tiles were laid next to each other, was really quilt-like. Thanks, Karen and the Westerville quilters! I had a great time. Laura Harms' little love bug of a baby is now home with his family after a bout in the hospital. We are all very happy about that. I loved seeing his sweet little face on her site this week. Now THAT is some inspiration! Laura's challenge for this week is to use her new tangle, lovingly called, Artoo. This tangle holds lots of rhythm and flow. It was great fun! I'm finding more and more that I love the shading process. Once the pen is down, I pick up the pencil and feel like I get to start all over again! The shading process gives me an opportunity to discover the shapes and layers that have emerged in the tangling process. Because I don't know where I'm headed in a Zentangle, I haven't planned for the shapes and layers, they have magically appeared. So the shading is when I go hunting for shapes and layers and play with 'drawing' them out. Once this was finished, I saw it had a womb-like quality, with the Artoo blossoming out of it. The womb is still in front, connected to the edge of the tile (the outside world). And the Artoo is floating to the outside world as well. Thank you, Laura for showing us more than just a fun tangle. My lovely friend and fellow CZT, Peg Farmer came for a visit and brought her finished January Tangle-a-Day calendar. It's exciting to see what others are doing with their calendars. Peg did each box, going through her library of tangles, doing whatever came next. I tried to find my favorite tangled day, but I soon gave up on that, as each one is really fun. I really love how she filled the letters. Very happy letters, yes? Thanks, Peg for sharing your first month with us. Can't wait to see what February brings! This week's challenge from Laura Harms really tugged at me from the inside out. Her little son is having his own challenges, and week #8 asked us to use this challenge to send him some 'good goo-goos' to help him through his. It's a wondrous thing when so many people hold one person in their hearts for even a minute. When I think of all the people who are thinking good thoughts and sending them to Artoo, many in the form of a heart-felt Zentangle, I fall in love with this growing community of tanglers all over again! As I finished the second, a third came over me. The '90s song, "Groove is in the Heart" kept running through my brain. I kept thinking about all the people out there sitting down to tangle a heart for Artoo. This last one is about this community of lovely people, all connected and swirling together. I am grateful to have found such a place. Thanks, everyone...this one's for you... groove IS in the heart. Many people experienced last week as a blur of ice and snow. Dayton Ohio, alone, had 70,000 people without power at one time, due to Tueday and Wednesday's battering of ice. As I look back on Tuesday night, I realize now that I was taking for granted that the power outage was going to resolve itself the way it usually does, maybe a couple hours. I was still in lala land, and enjoyed looking out the window at the glistening trees in my back yard. The wind was blowing little shards of ice through the air. There was something lovely about no sounds (no furnace blowing, no refrigerater humming, no tv chatter) other than that of icy rain playing its relentless little song on all the windows. We awoke on Wednesday morning, still without power. The house was a little chilly by then. Still thinking it might be short-lived (and not having a tv to tell us all about it), we turned on the gas fireplace, pulled the big couch right in front, and stayed under the covers for the rest of the morning. My husband and I both work from home for the most part, so the little break was kind of nice. The cats piled up on top of us and we napped away the morning. I didn't have a conscious idea about this when it began. I just kept layering one loop behind the others. The grid only came about as a filler for the open space. As it was done, I guess I could interpret it as a tangle of power lines imposed on a city's electrical grid. One thing I was aware of as I tangled this, was that you can't always take one situation and simply lay it on top of another. If you look at the Knightsbridge grid, it's not a straight grid that lies underneath the spirals. Each space, even though connected, is carrying the shape of the open (or negative) space created by the spirals. That's what i realized in the storm: Just because I'm in a familiar place (my own house), everything about being in that house and doing things in it had changed for the week: eating, sleeping, showering, sitting... everything. Each day brought a new question about how we were going to be with this unfamiliar situation in such a familiar place. Sort of like a Zentangle: each space and each mark requires a new response. It's so easy in our daily lives to go along, knowing what is coming next in our own spaces, in our own routines. Take that all away, and it's a lot of fun to marry together what we think we know, with what we don't know at all. Yum. A fresh new tile. A cup of hot tea. A blankie on my lap. 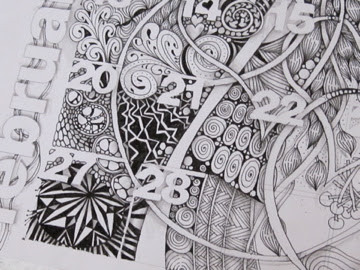 Creating the ceremony, as Laura Harms reminded us in her new challenge blog entry, is a wonderful part of the Zentangle process. This week's challenge is "breathe," and so much a part of the process as well, although, I have to say, it's one that is hard to remember. I often find myself taking a deep breath or two during a tangle, as if I had forgotten to breath. Don't know why, but that's how it goes. Each person has their own rhythm and what is a fun or comforting stroke for some, may totally irritate another! It's fun to pay attention to which tangles support your personal rhythm. It's also good to get out of the 'same olds' and try something new. This tangle was not one I had used much, but once I started, it was hard to stop. It really felt like breathing to me... back and forth, in, out, ebb, flow. I almost left it just like this, as simple as a breath. But my itchy little fingers wanted to keep going, finding all kinds of places to add to the rhythm. Even though visually, I'm not really crazy about the outcome, it was lots of fun getting lost in the minutia of the dance. Sort of like listening to music, and following every single note to its core. The second one was a little simpler. But just as much fun. Quiet and predictable, just like a breath. Thank you, Laura!